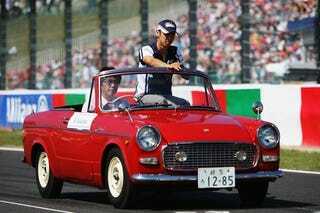 During the drivers’ parade that preceded the Japanese Grand Prix on October 4, Williams’s Kazuki Nakajima rode in this vintage Japanese roadster. Can you help us figure out what it is? The badge would make you think Prince Motor Company, the guys who made the original Skyline which lives on as the Nissan GT–R, but—as far as I know—Prince never made a small roadster. What makes the whole situation even more baffling is that I ran this photo by my friend Zsolt Csikós, who is a living and breathing encyclopedia of old Japanese cars, and even he came up blank. And when the guy who, roused from his sleep, can tell you year-by-year changes on fourty-year-old non-exotic cars comes up blank, you know you’re in trouble. So it’s up to you now, expert morphologists of a bygone Japan: what the hell was Kazuki riding in before he brought his Williams home to a not particularly shiny 15th place? Update: Jim–Bob and Graverobber to the rescue! It’s a Toyota Publica, pronounced paprika.